The Fujifilm FinePix S8600 is a small and powerful superzoom camera. 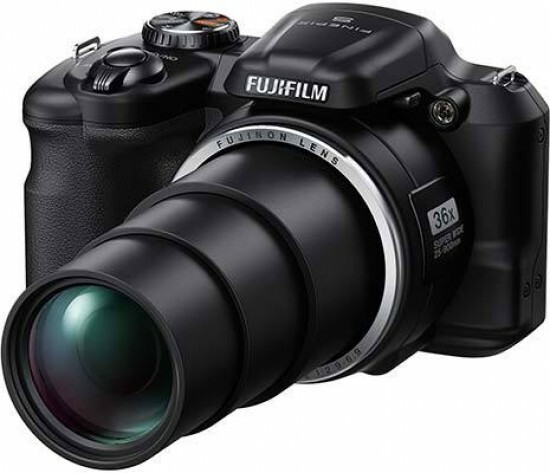 The Fujifilm S8600 bridge camera featues a powerful 36x Fujinon zoom lens, a high-quality 1/2.3in 16MP CCD sensor, and a host of creative features, all wrapped up in a pocket-friendly body. The Fujifilm FinePix S8600 will be on sale from February 2014 for £149.99. FUJIFILM is proud to announce the FinePix S8600 bridge camera featuring a powerful 36x Fujinon zoom lens, a high-quality 1/2.3in 16MP CCD sensor, and a host of creative features, all wrapped up in a pocket-friendly body; it’s the all-rounder you can take anywhere. So how do you squeeze such a powerful zoom into a camera that can fit in your coat pocket? It’s all thanks to the S8600’s newly developed three-step collapsible lens, which automatically retracts when not in use to leave a slim, stylish and, best of all, seriously compact body. In use, the huge zoom range offers a highly versatile 25-900mm equivalent meaning that users will be covered no matter whether it’s wide-angle landscapes or highly magnified action and wildlife shots they’re after. The S8600 even has a Super Macro mode that focuses down to just 1cm for detailed close-ups. And backing the lens up at every turn is Fujifilm’s sensor-shift Optical Image Stabilisation system to combat any trace of blur pictures. If 900mm still isn’t long enough, users can also employ Fujifilm's Intelligent Digital Zoom technology and increase the zoom to an incredible 72x (1800mm equivalent). To match its reach, the S6800 also boasts autofocus times as fast as 0.4sec (Tentative), a start-up time of 1.7sec and a shooting interval of just 1.3sec (tbd) for rapid-fire, responsive, and hassle-free photography. What’s more, its Scene Recognition Auto (SR Auto) mode recognises the subject you’re shooting (Portrait, Landscape, Night, Macro, Night Portrait and Backlit Portrait), and decides the settings required for optimal results, so there’ll no longer be any excuses for missing a perfect moment. And for those all-important action shots there’s a dedicated Burst Shooting mode, directly from the main Mode dial and rattle off a series of shots at 8 frames per second at full resolution for up to 40 pictures. Fans of shooting video, won’t disappointed by the S8600. HD movies can be recorded at 720p/30fps in cinematic widescreen 16:9 format, then shared with friends and family on the big screen using the camera’s built-in mini HDMI connector. What’s more, with a dedicated Video Recording button for faster shooting, users can leave the camcorder at home, and capture some great spur-of-the-moment footage wherever they are! Alongside its P, S, and M shooting modes for full manual control, the S8600’s Advanced Filter (Adv) function can be selected straight from the Mode dial, which gives access to gallery of 10 artistic effects, including High Key (which enhances brightness and reduces contrast for subtle and beautiful tones), Low Key (for dramatic dark tones with few areas of emphasized highlights) and Toy Camera (that creates strong vignetting for a supremely arty look). Added to this are Pop Color (to emphasise contrast and saturation), Miniature (for a blurred diorama effect), Partial Color (which retains a single colour and changes the rest of the photo to black and white), Soft Focus (for an even softness throughout the frame), Cross Screen (for a starburst effect), Dynamic Tone (to make a fantasy colour effect), and Fish Eye (which create a super-wide angle look). For the ultimate in control, all of these effects can be previewed on the LCD before the shot is taken. Wide: Approx. 7cm - 3.0m /2.7 in.-9.8 ft.
Approx. 1cm- 1.0m /0.3 in.- 3.2 ft.
(Auto mode) 1/4 sec. to 1/1500 sec. *The frame rate and the recorded number of frames varies with shooting conditions . * Use a card with SD Speed Class with "Class4" or higher. Telephoto: approx. 1.5 m - 3.6 m/ 4.9 ft. - 11.8 ft.
Telephoto: approx.2.0 m - 3.0 m/ 6.5 ft. - 9.8 ft.
121.3 (W) × 80.8 (H) × 64.6(D) mm / 4.8(W)×3.2(H)×2.7(D)in. # *3 Approximate number of frames / period that can be taken with a fully-charged battery based on CIPA standard. The FinePix S8600 will be on sale from February 2014. Its UK SRP will be £149.99.